Discover what the eBook Revolution is all about with this review episode of my favourite 3 interviews over the past 6 months. 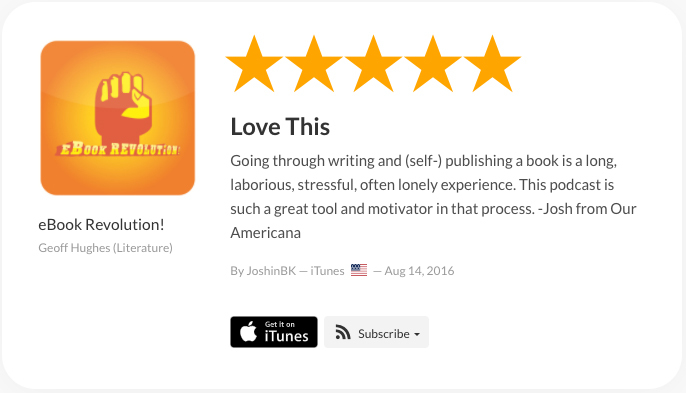 The eBook Revolution podcast celebrates writing, indie publishing, creativity and motivation. In this recap episode, listen to highlights from Bill O’Hanlon, Joanna Penn and Manny Wolfe. Bill reveals how he managed to get on Oprah to discuss his book ‘Do One Thing Different. Joanna Penn reveals how she uncovered the plot to her latest Arkane thriller. Manny Wolfe gives some insights into the myths of success that he writes about in his new book Tao of the Unbreakable Man.